Peoples in this world with dogs as pets sometimes think that the homemade foods are quiet better than dog foods available in the market. Although in some point of view it is correct but some homemade foods are really not good for your pet. It can lead to various hazardous health issues. Actually some people thinks that the homemade foods are always a good quality product and mainly one knows about the quality of the ingredient used in it. But sometimes it should be always kept in mind that all the foods which are good for humans are not at all for the animals. It is always suggested to consult with a Veterinary doctor or an animal nutritionist before giving a food to your lovely dog. Actually animal can eat each and every food as they don’t know what is good or bad for them. So it is our duty to serve them with foods that are always a good option for them. 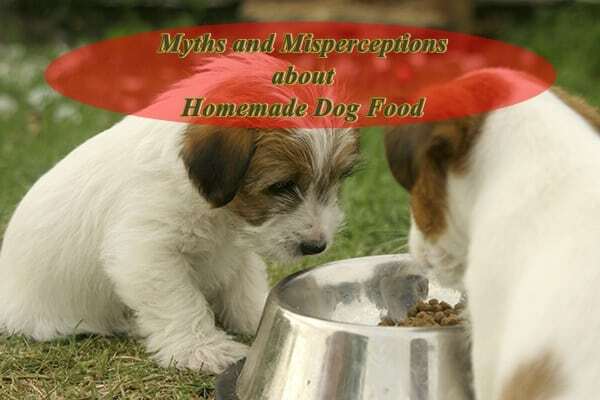 This article details in some of the misperceptions and myths related to the homemade foods we serve to the dogs. • ‘I read a lot of human nutritional books and follow the same nutritional remedies with dogs’ – This assumption is very common among the pet owners but actually it is not correct one. The nutritional need of human is totally different from that of dogs. So it is never possible that all the remedies written in a human nutritional book will work out with dogs. So be very careful about that. You may get many nutritional remedy books for dogs available in the market bring it and read out to get the correct information. • ‘Giving fresh vegetables to dog is very beneficial to dogs’ – This point is very controversial as some thinks that giving a dog fresh vegetable diet is very beneficial for them while some people think that green vegetables doesn’t meet all the nutritional value. Actually you have to remember that dogs are carnivores so they need some high protein foods to live healthy. So vegetables can’t meet all the protein needs while some vegetables are really good for dog health and some are really harmful for them. So it would be much better to consult with a veterinary doctor. • ‘Raw diets are always a best option for Dogs’ – This is not at all a correct conception as there is not such proved theory that uncooked foods are great diet option for the dogs. Some raw foods can be dangerous to dogs also. So before going to the option of serving raw foods you should acquire some information regarding it. • ‘To provide enough calcium I serve my dog with yogurt regularly’ – Dogs need a lot of calcium in their body but that doesn’t means that giving yogurt will meet all the calcium needs. There are lot of other calcium rich foods which all together meets the calcium needs of your pet. Yogurt alone can never meet such a high amount of calcium needs. • ‘Serving fresh and wholesome food will meet all my dog’s need’ – This point have little bit of logic in it as fresh foods are always good for health and fresh homemade foods area always good in quality. But all the fresh wholesome foods don’t meet vitamin and mineral need of a dog. So it is quiet a good option if you study little bit on this topic or consult with an animal nutritionist regarding this matter. • ‘Dogs of all age have the similar diet’ – This is a totally misperception among the people. As humans changes their diet according to their age the animal diet should also be changed according to their age. Actually the nutritional need varies with ages and for that the diet also changes with the nutritional needs. So it can never be possible that dog will have similar diet in all age. • ‘Raw foods are not at all a best option for dogs’ – As some people think that raw foods are the best option, some people also think that raw foods are the worst option. Actually both of the ideas are incorrect it is neither best nor worst. Some raw foods are really good for dogs. Now the main thing is that you have to gather information about the whole process. After that it is your duty to decide which will be your choice while feeding your dog. • ‘My dog have loose stools, so it will be better to stop fiber foods’ – As we know that foods with high fibers are always a good diet. But still if you see that your dog is having loose stools then you should serve some bland food or decrease the amount of food given to your dog. If it still pursues then contact with your nearest Veterinarian. • ‘Dogs don’t require carbohydrate’ – Some research says that dog doesn’t have any particular carbohydrate requirement but it is misunderstood by the people that dog doesn’t need any carbohydrate. Actually dogs never suffer from any disease caused by carbohydrate deficiency but it is not also correct that dog doesn’t need any carbohydrate food. Actually carbohydrate provides energy and keeps the gastro-intestinal function healthy. • ‘Multivitamin added to the food will cover any inadequacy’ – It is a full incorrect idea to add multivitamin in any food before serving it to a dog. Actually homemade food varies in their nutritional characters. So adding just a multivitamin can’t solve the problem as it doesn’t become a balanced diet. And pets generally needs balanced diet to stay healthy. After all the above discussions it is always recommended that consultation with an animal nutritionist or a veterinary doctor is the best option to keep your dog healthy in all the ways. As we people suffer from misconception and misperceptions regarding these matters sharing all these with experienced peoples may clear out the confusions.